Sometimes I get guilty about downloading stuff for free, so I’m almost glad when there’s something I want but I can’t find it online anywhere. Then I have to buy a real life physical copy and for a short time I’m able to convince myself I’m better than people who just take, take, take and never give anything back. However, maybe I’m also stupider than those people. Twice in a row, I’ve had to pay customs tax (and the admin charge that the Royal Mail puts on top of that) on something I’ve ordered from Japan. That's £13, about half the price of what I ordered. Most recently, it was the film Live Tape. I was sick of waiting for it to come out on DVD, so I ordered it. And it’s very nice, too. But to make things more annoying, it took so long to arrive that I’ve arranged another holiday in Japan. If I'd waited a bit, I could’ve bought it while I was there and not paid the surcharges! I’m going next month, but already I’ve had two set backs. I was going to do the Kumano Kodo, but it seems you have to book more than a month in advance to be sure of hotel places. The other set back is that Maggot Gallery – the tiny but lovely photography gallery in Osaka – has closed! Just last month it held it’s final show. I’m a bit sad about that. I do like to revisit places I’ve been before, and I was looking forward to going back their to see what they had on. 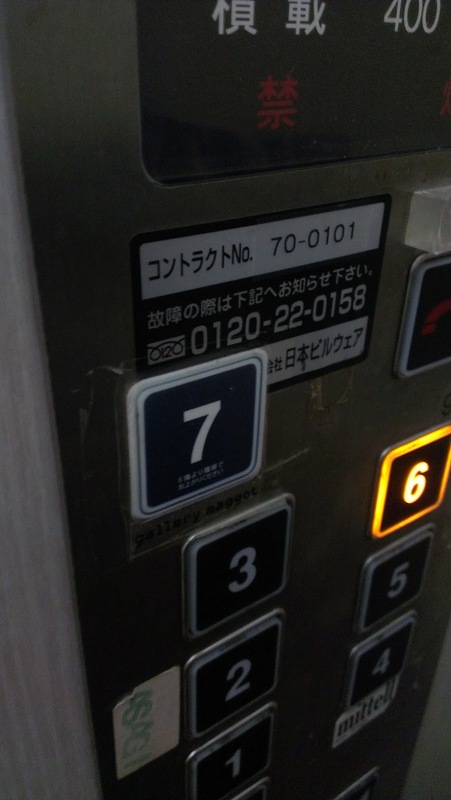 I'm also going to miss the sticker on the lift, made to look like the other lift buttons, which I tried to press the first time I went there, and then couldn't work out why the lift wasn't moving. Oh wow, you have to pay extra charges for buying stuff online? I buy stuff online all the time, and we usually don't get tax on the mail unless it's electronics or purchases that go over $100USD (for this you usually get your order withheld and you gotta pick it up from the post office). Yeah, the charge for importing DVDs etc has always been there, but I guess people are buying less stuff online, because I never got charged before: I guess because my stuff slipped by in the crowd. But now I got hit twice in a row, that shows it's easier to spot. Your friend got lucky. I bought from HMV Japan and got customs charges. I don't think it matters where you buy it from, unless the site is clever (and dishonest) enough to put "gift" on the description of contents label.